Ein el Sultan Refugee Camp - Where is Ein el Sultan Camp Located? The original inhabitants came from throughout historic Palestine. Before the 1967 Arab-Israeli conflict, the camp accommodated some 20,000 refugees. During the war, however, most of the refugees fled to Jordan. The remaining refugees originate from the Ramleh, Lydd and Hebron areas. Where is Ein el Sultan Camp Located? Ein el-Sultan camp was established in 1948 on 0.87 square kilometres, it is located below the Mount of Temptation and 1km from Jericho. 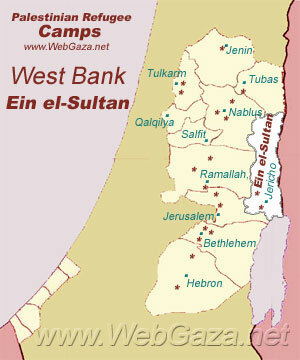 Like other West Bank camps, Ein el-Sultan was established on land UNRWA leased from the government of Jordan. Following Israeli redeployment in 1994, the camp came under Palestinian Authority control. UNRWA supplies Ein el-Sultan with water by pumping it from a nearby spring. While all shelters are connected to water and electricity infrastructure, water shortages in the camp cause tremendous hardship for the refugees, especially in the summer months. Around four in ten people are unemployed.